I found a color challenge that I wrote down but I can't figure out which challenge it was! The colors were Baja Breeze, Pretty in Pink, Pink Pirouette, and Real Red. Those are the colors I used to emboss the hearts with the new Fashionable Hearts embosslit die. The card base is Whisper White and was scored 1/8" from edge edge with the new Simply Scored tool. 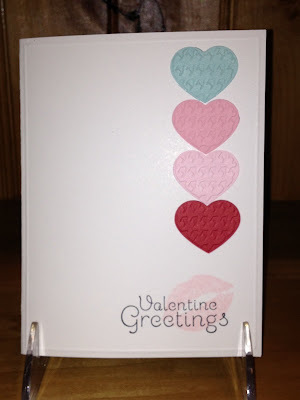 The Valentine Greetings (Grateful Greetings stamp set) was stamped in Jet black Staz-On, and Pink Pirouette was used for the S.W.A.K. Clean and simple is usually not my style, but I love how this card turned out. Thanks for stopping by! I hope your weekend is wonderful! Labels: DIVASC171, Fashionable Hearts embosslit die, Grateful Greetings, S.W.A.K. So cute! I love that lips!!! I too love the lips!!! 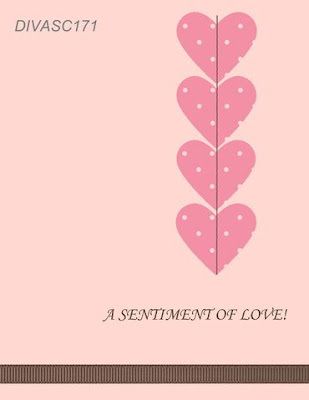 I especially like how you did the little border around the edge of the card, it adds so much and makes this a really sweet, simply elegant card! So cute! I love that you added the blue. It's not a typical Valentine's color, but it looks great with that combo! Love it! Your greeting is too adorable!